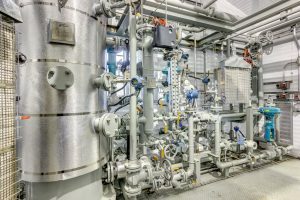 Beyond the many other variables involved in building a gas compression package, there’s a perennial point of discussion between producers and suppliers. Will that be standard or custom? Scott Douglas, Compass VP of Sales and Marketing, maintains either can be the right choice depending on the situation. Compass’ compression business, is in fact , basically evenly divided between standard and custom. If the producer’s operational objectives can be achieved with a standard package, so much the better. The producer saves money compared to custom. It also reduces the amount of engineering needed, and allows for more efficient, consistent, high-quality manufacturing compared to a package that’s built less frequently. The term standard might suggest a compression package design that’s set in stone. As Douglas explains, Compass constantly receives feedback on the performance of its standard packages and improves them over time. At times, however, a producer might want customization while Compass believes a standard package could do the job just as well, less expensively. The decision rests with the customer, of course, but Douglas and his account managers will advocate what they see as the most suitable, most economical solution for the situation.